The projected costs and benefits of helping to develop commercial spaceships, part of NASA's plan to focus on exploration rather than transportation, drew skepticism today (Oct. 26) from members of a House panel. While leaders of various commercial space companies spoke up for their industry's prospects in front of the Committee on Science, Space and Technology, lawmakers questioned whether there will be enough of a market in space transportation and tourism to justify taxpayer investment in new, private vehicles. Such ships will need more customers besides NASA astronauts to be profitable, the lawmakers said. "NASA seemingly takes the position of 'Build it and they will come,'" said committee chairman Ralph M. Hall (R-Texas). "From my perspective, the business case is not very compelling." If there are no customers beyond NASA to purchase seats on these new spaceships, it "could put the government in the position of supporting, or bailing out, commercial companies" in order to preserve a national space transportation capability, Hall said. Other commercial executives, representing Boeing, Sierra Nevada Space Systems, ATK Space Launch Systems and United Launch Alliance, said their businesses would be successful even if NASA were the only customer for their space transportation services. But they also mentioned other likely sources of income for their private space taxis, such as cargo transportation and satellite servicing, as well as selling rides to private citizens and to astronauts from countries without their own space programs. "It's been demonstrated that there are individuals that would pay to fly to the space station," said John Elbon, vice president and general manger of Boeing's Space Exploration Division. "There are also other countries in the world that would like to have their own space program but can't afford the infrastructure associated with that." 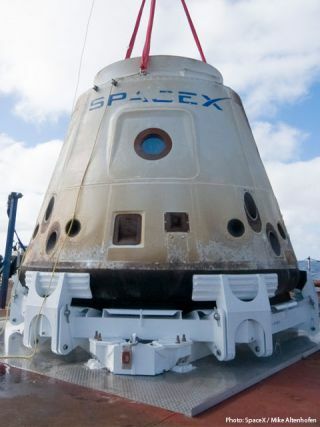 The lawmakers added that these private spacecraft, once they became available for trips to the International Space Station, might not be significantly cheaper than the current mode of transport: Russia's Soyuz spacecraft. In fact, they eventually might be more expensive, they claimed. Russia currently charges about $63 million per seat for a ride on its Soyuz, and the prices are likely to rise to $80 million in the future. The cost of a ride on commercial American space taxis won't be clear until the vehicles are fully built. "It certainly appears that we're paying a lot more per seat than we're paying the Russians now," Rep. Brad Miller (D-N.C.) said. "It sounds like it's a lot more expensive than the deal we have now." Bill Gersteinmaier, NASA'sassociate administrator for Human Exploration and Operations, said commercial spacecraft probably will be able to offer a cheaper alternative to the Soyuz. Musk even went on the record to say his company could bring the ticket price per astronaut down to $20 million. Whatever the final price for space taxi seats, it will come on top of the roughly $6 billion NASA will have spent underwriting the ships' development. "We have to decide whether it's worth paying a $6 billion premium in taxpayer dollars in order to make a domestic ISS transportation system available," said Rep. Eddie Bernice Johnson (D-Texas). "I would rather not pay money to the Russians either, but I will find it hard to justify." Rep. Donna Edwards (D-Md.) raised another concern about the commercial crew program: Why should taxpayers fund development of private vehicles that will then belong to private companies and not to the U.S. government? "It seems to me that we're running on a course of eventually the taxpayers subsidizing a monopoly," Edwards said. She said the country could end up footing an even bigger bill by renting services from companies that relied on significant taxpayer money to develop their products. Gerstenmaier responded that those companies would also be investing much of their own money. "The return for the taxpayer is we get a service at a lower price," he said. "The return for the company is they have a product" that they can then sell to as many customers as they can find. Not all the panelists were so hard on the private space firms. "I have been surprised by a number of things in my 24 years here in Congress, but one of the things I've been surprised the most about is the hostility that seems to be expressed" toward commercial space companies, said Rep. Dana Rohrabacher (R-Calif.). "I consider this to be a historic moment for our country. This anti-commercial space attitude that I see, I think it could have very grave consequences." And despite their opposition to aspects of the plan, many lawmakers expressed support for what the companies are aiming to do. "The companies appearing before us are doing exciting work, and they're a great example of American industry's capacity for innovation," Johnson said. "For all my seeming skepticism, I'm willing to be convinced I'm wrong," Hall said, "and I hope I'm wrong."